All 4 of the characters are diverse enough to accommodate many different play styles, from safe and laid back, to kick down the door. Playing the base sets without Society rerolls is terrifying and everyone's ability to examine location deck cards is extremely invaluable. Two characters are proficient with ranged weapons while the other two are better with melee weapons. Several weapons (longbow's in particular that let you add strength die) are awesome includes that any character can benefit from. There's plenty of utility and flexibility with the boons provided for any type of ranger you want to build. These rangers are great at supplying firepower from afar through both weapon powers and character powers, making them excellent team players. I purchased the ranger class deck and have revisited characters several times. We have several different rangers in our group and everyone has been very effective at keep us out of trouble but also fielding difficult banes when they do appear. If you're unsure of which class deck to purchase first, I highly recommend the Ranger class deck. Plenty of great options for your ranger deck. Also includes alternate rangers for your friends to play, so they will keep their grubby fingers off your beloved harsk deck. 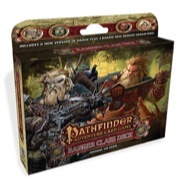 It is not part of the Pathfinder Adventure Card Game subscription, but PACG subscribers who order it will receive their subscriber discount on it. I've always been under the impression that the ranger was a solo, high damage dealing individual with keen senses. The way the ACG game plays makes this idea interesting, as it is a constant stack of duals (a departure of which would be welcomed from time to time)... In the base set the rogue plays like my vision of a ranger, as the ACG rogue is lethal and independent however a rogue tends to be extremely fragile. They work best with a group whereas the ranger is truly a loner spending years wandering solo in the woods with nothing but his wits and animal companion. I think the class decks are a great way to explore these other possibilities, but I'm saddened by the chosen direction at this juncture. A ranger who hunts mages is novel, and two dwarfen rangers is near-to heresy. I wish I were more intune with Pathfinder lore so I could understand why these choices have been made, but alas I am not.